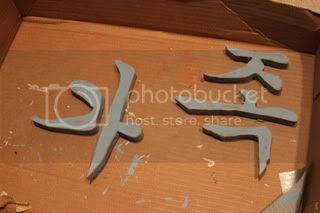 Korean writing is called Hangul. Our youngest son was born in Korea and I wanted a way to display something from his birth culture yet something that has meaning for our whole family. I had seen some great distressed wood signs and knew I could combine the two to make a neat sign for the wall in our entryway. 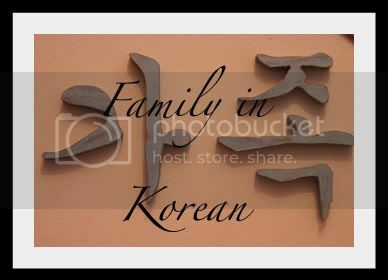 Using an online translator I translated the word family from English to Korean Hangul. Now for simple words the translators work pretty well but it is always a good idea to ask someone who knows that language to double check. 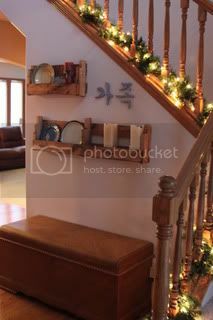 You would hate to put a word up on your wall that means something different than what you think it says. Once I had my word translated I copied and pasted it into a word document. Then found a font that I liked. 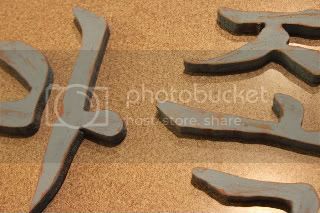 Chunky fonts that are thick type work best for cutting out of wood. I blew up my word to the size I wanted for my wall and printed it out. 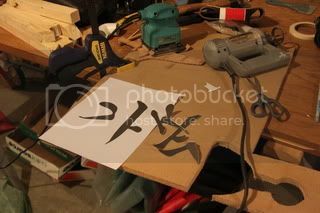 Then cut out the word and traced the parts onto wood. I took my Rotozip and carefully cut out the letters on the wood. 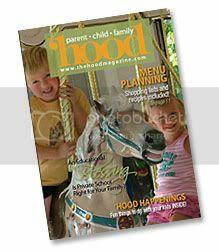 A Rotozip is kind of like a drill but the bit on the drill you can use to cut things by moving it sideways across the wood. 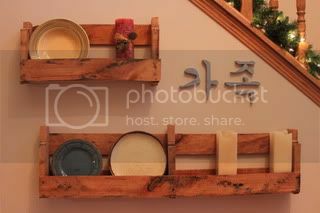 You can use any kind of wood but I used pressed wood board which is made of glue and wood pieces. 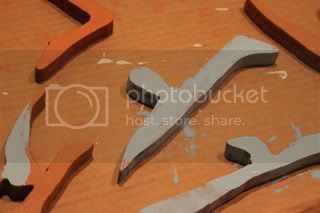 I knew I was going to be painting it anyway so I really didn't need visible wood grain and I happened to have scraps on hand that would work well. 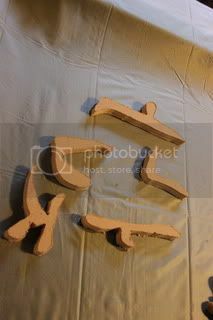 I sanded the pieces after they were cut, then put on a thin layer of burnt orange paint. Then a layer of light blue. I did not let the blue dry all the way before sanding some parts away. I wanted it to look old and distressed. I sanded the edges because if it was old it would have more wear in those places. 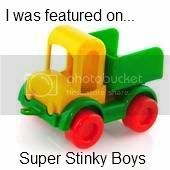 They still didn't quite look old enough. I was considering some dark stain but didn't have any. What I did have on hand was brown and black shoe polish. I used those two to make them look a bit more old. Then I hung them on the wall with 3m strips. I think it was the perfect thing to fill the space. Sharing this one with Katie! 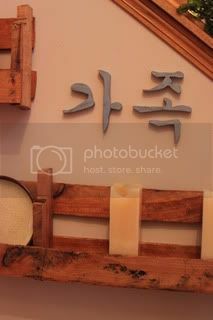 Especially appropriate that you share it with me, seeing how I am also adopted from Korea:) This is a wonderful project! It's a shame I don't know more about my original culture, but truth be told my parents tried and I just could not be botherd. Now I regret that decision but as a child I wanted to watch cartoons and ride bikes on Saturday morning and not attend Korean classes. I like that is lovely and eye catching but still understated. Good point that you certainly do want to make sure you're putting up what you think you are and not some kind of insult by mistake!